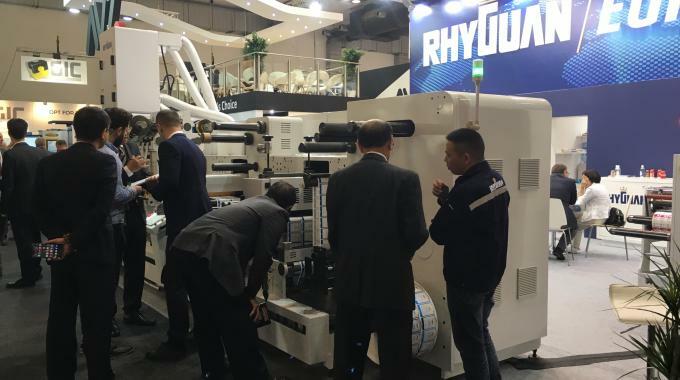 Rhyguan Machinery, a Chinese manufacturer of label converting equipment, has launched its latest digital finishing machine, Plus 330 Gravure, at Labelexpo Europe 2017. The system includes rotogravure printing and coating units, with six meters or more drying length, and speeds of up to 120m/min. The rotogravure coating unit can be used for adhesive coating, reverse printing of labels, counterfeit labels, over-laminating and tape making, as well as surface coating, such as top coating for HP digital printing, top coating for UV printable ink, color coating including reflective inks, fluorescent inks and matte coating.